A serene setting comparable to a nature preserve, but only minutes from shopping, restaurants, and other conveniences. 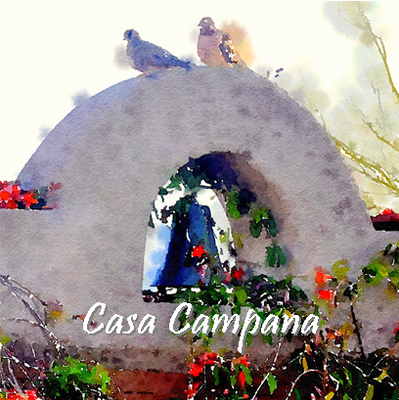 Welcome to Casa Campana, consistently one of Southern Arizona's highest rated vacation rental properties. This stunning 3,000 sq ft custom southwest traditional home (with an additional 1,000+ sq feet of covered patios) is situated on 3.3 private acres in the Tortolita Mountains foothills of the northern Tucson area, adjacent to the Dove Mountain resort community. Bordered by similar southwest estate-sized properties, as well as over 20 acres of undisturbed, pristine Sonoran desert, Casa Campana's privacy is hard to beat. The majestic Sonoran Desert is breathtaking and perfect for biking, hiking or just relaxing and taking in the surrounding beauty. Enjoy the private setting and incredible views while maintaining a close proximity to shopping, great restaurants and some of the best golf Tucson has to offer. Open the gate to the serenity of the front courtyard, perfect for enjoying morning tea, curling up with a book, or sharing intimate dinners. The soothing fountain, whimsical hummingbirds, comfortable furnishings, and magical evening lighting offer unique solitude and a calm hideaway setting the stage for a unique experience. Once inside the home, you will be impressed by the spacious great room with polished concrete floors, high beamed ceilings and extensive custom woodwork throughout. With its championship billiard table, 60-inch flat screen, Bose surround sound and the latest media choices, this great room serves up countless entertainment options. Discerning cooks will feel inspired in the fully equipped kitchen, complete with impressive views of the mountains, desert and the richly landscaped yard. The striking king master suite is beautifully appointed and includes a small office work space, views of the Catalina Mountains and direct access to the covered patio, hot tub and swimming pool. The master bath provides a large walk-in shower with dual heads and separate soaking tub perfect for indoor relaxation. The master suite and three equally charming guest rooms all include flat screen TVs with Satellite/DVR access and Blu-ray DVD players. Bed arrangement includes: Master Bedroom - King, 'Tahoe Bedroom' - King, 'Southwest Bedroom' - Queen, and 'Route 66 Bedroom' - 1 Queen & 1 Full. While the home's interior is very comfortably furnished and equipped, Arizona life is all about the outdoors. Enjoy the exquisite weather year-round from the expansive outdoor living spaces including fully furnished covered patios, spa and heated swimming pool with natural boulder water feature just steps away. Lose yourself in the surrounding beauty, sunning in the lagoon, relaxing on the king size Bali-style poolside lounge bed, or gazing at the city lights while gathered around the gas fire feature at night. This Sonoran outdoor oasis is sure to captivate with its surrounding desert wildlife and beauty. It is our sincere pleasure to welcome you to Casa Campana.